While other brands cut corners and use low-grade, low-nutrition steer meat in their chewy dog treats, our gourmet dog treats are made of top quality grass fed, free range Angus bull meat. 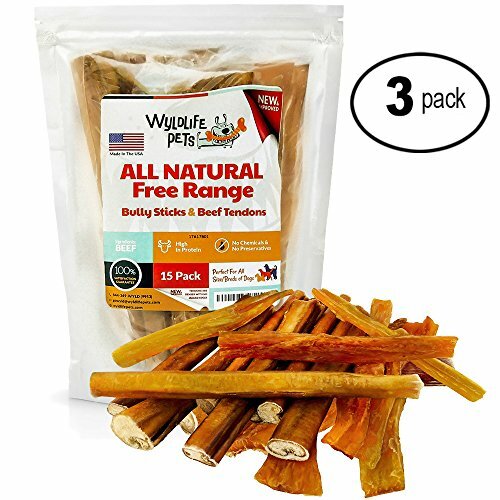 Includes three 15-piece combo pack with 8 thick, 6-inch genuine bully sticks + 7 beef tendons in each pack great for all dog breeds. Made in the USA and FDA and USDA regulated. Many odor-free dog chew treats on the market contain chemicals and bleach that can make your pet sick - and aren't even odorless! Our dog jerky treats are all natural andeasy for your pet to digest, with no chemicals, hormones, preservatives, or additives. Just high quality, natural beef with a scent that dogs can't get enough of! It's common for dogs to become anxious when left alone,and often they take it out on your favorite shoes or furniture. Soothe your dog's anxiety with our long lasting bully sticks, which give your pet a delicious sensory experience and keep him occupied and comforted for hours. Chewing on our bully sticks helps dog dental health by removing built-up plaque and tartar and promoting health teeth and gums, while our beef tendons for dogs strengthen joints and cartilage with glucosamine and chondroitin. Low in fat, high in protein, and packed with natural vitamins and minerals that are vital to your dog's health, ours are the best bully sticks forpuppy training, rewarding good behavior, and overall dog wellness. Try the Wildlife Pets difference.Our healthy dog treats are made of thehighest quality all natural ingredients, sustainably sourced from within the USA, and USDA & FDA regulated. If for any reason you aren't satisfied, contact us directly so we can make things right - we offer a 100% satisfaction guarantee or your money back. ★ WHILE MANY SO-CALLED ODORLESS BULLY STICKS CONTAIN BLEACH & OTHER CHEMICALS to make them odor-free, these can make your pet sick & often aren't even odor-free! Our natural dog treats are easy to digest & free of chemicals, additives, preservatives & hormones, with a natural scent dogs love! ★ UNLIKE BRANDS THAT USE LOW-QUALITY, LOW-NUTRITION STEER BEEF IN THEIR PET TREATS, our dog treats are made of top quality, grass-fed angus bull meat. Includes three 15-piece combo packs, with 8 hearty, 6-inch bully sticks + 7 beef tendons in each pack. Made in the USA and USDA & FDA regulated. ★ SAVE SHOES & FURNITURE FROM YOUR DOG'S ANXIETY! When left to their own devices, dogs can become anxious & take it out on your belongings. Our long-lasting bully sticks soothe anxiety and keep your pet occupied. Great puppy training treats for small dogs & large dogs! ★ KEEP YOUR PET HEALTHY & HAPPY! The best dog treats for all breeds, our canine chews are full of vitamins & minerals that are essential to a dog's health. While bully stick dog dental chews remove plaque & tartar, beef tendons provide chondroitin & glucosamine to strengthen joints & cartilage. ★ WE BELIEVE DOGS ARE AN ESSENTIAL PART OF THE FAMILY. That's why our dog snacks are made of top quality natural ingredients, sustainably sourced from within the USA. If for any reason you aren't satisfied, please contact us directly - we offer a 100% satisfaction guarantee or your money back. If you have any questions about this product by WyldLife Pets, contact us by completing and submitting the form below. If you are looking for a specif part number, please include it with your message.